1-1 sessions for adults, young people and children. We provide a wide range of services to support your health and well-being and utilise therapies, strategies and modalities that can help you to make positive changes in your life. Whether you wish to overcome, manage or improve your issue, we will always take the time to discuss your needs and offer a FREE no obligation telephone consultation to enable us to decide together, if In Mind Therapies is the right place for you. Sessions can give you the opportunity to devote some time to yourself. Your life challenges are just as unique as you are . Whether you wish to manage stress, IBS symptoms or weight, reduce feelings of anxiety before hospital treatment or work on low self esteem – you will find support and encouragement whilst you make the positive changes you need, to improve your wellbeing, health and happiness. Anxiety, Blood pressure, Assertiveness, Behaviour difficulties, Career, Confidence, Dental phobia, Depression, Eating Disorders, Exam nerves, Fears, Fertility, Headaches, IBS, Insomnia, Life issues, Loss, Motivation, Negative thinking, Pain management, Panic attacks, Phobias, Public speaking, Relationships, Relaxation in childbirth, Self esteem, Stress, Stress based medical conditions, Trauma and Sports performance. Children and young people today are faced with ever increasing pressures and stresses. As well as growing up and going through changes in adolescence – family life, school, peer pressure and self image can also have a huge impact upon how they feel and cope with situations. In Mind Therapies offers children and young people, a supportive environment in which to work on their life’s challenges. If you are a young person, rest assured your issues will always be dealt with in a sensitive manner. We want to help you. Whether you need help to manage stress & exam nerves, overcome low self esteem and need to build your confidence, you can work in a fun, safe and relaxed environment. If you are a parent, it can be a worrying time too, but helping children to overcome or cope better with life now, can make a positive difference to their future. (Please note that it is important that the young person wishes to gain help). If you are the parent/carer of a child or young person that you feel might benefit from 1-1 sessions, please do not hesitate to give us a call. If we are in a session and cannot take your call, please leave your name, number and your message and we will get back to you as soon as possible. 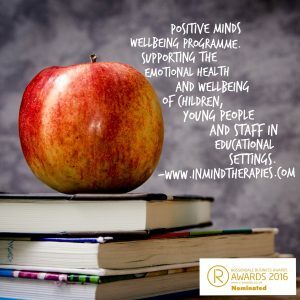 1-1 sessions can also be provided in schools under the Positive Minds Wellbeing Programme. We offer a FREE 30 minute telephone consultation.